As a disruptor of the traditional insurance industry, it may come as no surprise that we get a lot of questions. We get it – insurance is confusing, technology can be confusing, and people want to know how it all works. Here at Metromile, we’re all about giving the people what they want. The key to pay-per-mile car insurance is the Pulse device; it’s what securely counts your miles so we can bill you appropriately. Today, we’re taking a deep dive into the Pulse – what it is, what it does, and how we use it to save you hundreds on your car insurance. Telematics is the technology of sending, receiving, and storing information relating to remote objects, like your car, through telecommunication devices, such as a cell phone, a GPS system, or our Pulse device. Telematics technology can track how many miles you drive and can also measure driving behavior. Telematics is what enables Metromile’s insurance – and without it, pay-per-mile simply would not be possible. The combination of a GPS system with onboard diagnostic technology can show you a car’s location and the trips the car has taken. Basically, it is the technology used behind the wheel to give the driver information about their car or where they are going utilizing both internet and satellite connectivity. The first form of telematics started with navigation systems, eliminating the need for printed directions and old-fashioned maps. Instead, drivers were able to use the easy navigation system set up in their car. Telematics has since expanded to alerting drivers about their fuel levels (fuel monitoring) and traffic alerts. Telematics technology can even help drivers with roadside assistance and enable satellite radio. 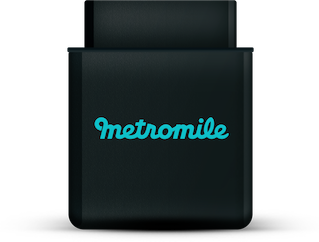 Metromile uses a telematics device called the Pulse: a small electronic gadget that plugs into your car’s diagnostics port and collects data about your driving. This isn’t a new concept: many insurance companies use telematics to track their customers’ habits behind the wheel, such as average speed and instances of hard braking. But Metromile only charges you based on your mileage, not driving behavior. We believe the biggest risk factor for getting into an accident is mileage – if you aren’t on the road, you won’t get into any accidents. As such, our primary rating factor is mileage, not driving behavior. Metromile gives you insight into your car’s health, location, and driving data – like fuel economy and trip data – through the Metromile Pulse. The Pulse uses telematics technology, which connects to a cellular network, to transfer the data collected from the car into our smart driving app. The app will notify a customer if the Pulse detects an error code from the vehicle. This code could be related to an engine, exhaust, or some other type of sub-system within the vehicle. The customer can tap on the engine code within the app to reveal an overview car that provides a detailed description of the issue along with the severity of the case. The customer can also check the health of their car at any time within the app by tapping on the car avatar on the overview screen to see a list of any codes and previously found codes. What is the Metromile Pulse? The Metromile Pulse is a small, wireless device that plugs into your vehicle’s onboard diagnostics port (OBD-II). Once you become a Metromile customer, we will ship a Pulse device to you for you to install in your vehicle. Don’t worry – installation is easy. See the tutorial below on how to install the Pulse in your vehicle. Once in place, the Pulse securely counts your miles to determine your total monthly bill. The Pulse works directly with Metromile’s smart driving app, supplying added features like trip tracking, monitoring your vehicle’s health, and a GPS vehicle locator. What does the Pulse do? How does the Pulse work? The Pulse is the key to pay-per-mile insurance. The Pulse is able to use your GPS location to count your daily mileage, decode Check Engine Light readings, and act as a GPS device. The Pulse is powered by telematics technology, which sends, receives, and stores your car’s data. You can also make use of this data through Metromile’s smart driving app. Can I get a Pulse device if I’m not a pay-per-mile insurance customer? Sadly, no. Currently, we only offer Pulse devices to Metromile pay-per-mile insurance policyholders. You can learn more about pay-per-mile car insurance here. Is it mandatory to plug in the Pulse? The Pulse must be plugged into your car at all times so that mileage can be accurately measured and billed. There are exceptions, however. For example, when you get your car serviced, it’s okay to remove the Pulse so that the mechanic can access the OBD-II port. If your Pulse stops transmitting a signal to Metromile at any time, you will receive a notification via email alerting you to plug the Pulse back in. You are covered as of the effective date of your policy, whether or not your Pulse device is plugged in. As you near your policy effective date, we will ship your Pulse device to you, be sure to plug it in as soon as you receive it. You will receive email reminders once you receive your Pulse device to plug it in to avoid penalty charges. Not to worry – the Pulse device should have little to no effect on a healthy car battery. Even if your car isn’t being driven, the pulse will not drain a healthy battery. Does the Pulse sync with my smartphone? The Pulse operates independently by transmitting data securely through a cellular modem and does not sync with your smartphone. In order to set up the Pulse, plug the device into your OBD-II port and check to see if there is a pulsing red/orange light. That’s it. Once you see the light, the Pulse has been connected and is securely sharing your car’s mileage data with Metromile. Even though the Pulse does not sync with your smartphone, Metromile does offer a smart driving app that works in conjunction with the Pulse. The app keeps you up-to-date on your car’s health, tracks your car’s location with GPS features, and sends street sweeping alerts in select cities. It’s just another bonus we love to provide to our loyal customers. Absolutely. To disable the GPS function on your Pulse, navigate to your online dashboard. Click the small arrow pointing down in the upper right-hand corner next to your account avatar. Go to ‘Account Settings’ and switch ‘Location Services’ from ‘Yes’ to ‘No.’ Please note: this will also disable Metromile’s smart driving app features such as trip tracking and street sweeping notifications. What happens if I unplug the Pulse? If you unplug the Pulse for any reason, you will receive alerts to your email associated with your Metromile account asking you to plug the device back in. For all pay-per-mile insurance customers, the Pulse must be plugged into your car at all times so mileage can be accurately measured and billed. We understand that there are times when you may need to unplug the Pulse, like when you get your car serviced. Don’t sweat it — it’s okay to remove the Pulse so that the mechanic can access the port. Be sure to plug the Pulse back in once your service has been completed. If I cancel my insurance policy with Metromile, can I still keep the Pulse? If your insurance policy is canceled for any reason, you will need to return the Pulse to Metromile using a provided pre-paid envelope. If we do not receive your Pulse within 30 business days, your pre-authorized debit or credit card on file will be charged a $100 fee. We take the security of our products and services very seriously and actively work to ensure that our products are safe and provide benefits to our customers. My Pulse was stolen or not delivered. What do I do? If your Pulse device was never delivered or stolen please give us call at (888) 244-1702, 6am – 6pm Pacific Time, Monday – Friday to update your shipping information and get a new device mailed out. What do I do with the Pulse device if I sell my car and/or get a new car? Please be sure to remove the device before you sell your vehicle. If you are replacing your old vehicle with a new one, you can use the same device from your previous vehicle in your new car. Please either contact us or navigate to your DASHBOARD to add the new vehicle to your policy. What if I rent a vehicle? Do I need to install the device? When renting a vehicle you are not required to plug the Metromile Pulse device in, so please leave that device plugged into the vehicle listed on your policy. Got any lingering questions we didn’t cover? Give us a call at 1.888.311.2909, send us a DM, or Tweet at us. If you haven’t yet downloaded the Metromile smart driving app, you’re missing out on some majorly cool features, such as trip tracking, vehicle diagnostics, parking location, and more! Click here to download for your iPhone, or here to download for your android. If you’re a low-mileage driver who hasn’t made the switch to Metromile yet – what are you waiting for? Grab a quote from us anytime, because it’s always free. Be safe out there and see you on the roads.